Unsolicited email has been a problem since 1978 when Gary Thuerk of Digital Equipment Corporation sent quotes of DEC computers for sale. Now it has grown at an unprecedented rate, to a point that 45% of all global emails are spam. With this nasty statistics in-mind, email client vendors such as Microsoft is taking responsibility for empowering their end-users to block spam. 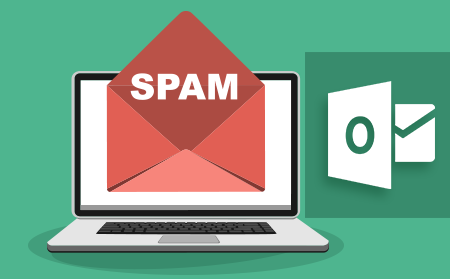 The anti spam filter Outlook algorithm comes with the Microsoft's email client, and users can adjust it as they see fit. Outlook accomplishes this with its embedded "Junk Email" folder, the AI used by the anti spam filter outlook algorithm depends heavily on the software version. The newer the Outlook version, the more comprehensive its anti spam filter outlook algorithm is. Junk Email folder is a special part of the user's mailbox where suspected spam and phishing emails are "quarantined" by the anti spam filter outlook algorithm. Users are highly advised to regularly check the contents of the Junk folder, as some genuine emails are one way or another mislabeled as unsolicited email. This small portion of false positive is a trade-off with using an automated anti spam filter Outlook algorithm. If a legitimate email is found in Junk Email folder, please feel free to restore it to the main mailbox folder. Un-categorizing spam email can also be done by clicking Home, Junk, Not Junk option. Junk Email filter is enabled as soon as Outlook is first used, with no manual filter set, the protection is only basic. This basic configuration is set by Microsoft during development time and receives regular updates as soon as Outlook application is also updated through the Microsoft Store. End users can redefine their configuration by clicking Home and Delete group, Junk, Junk Email Options. High - This uses the strictest form of anti spam filter Outlook algorithm as defined by Microsoft, it has the least chance for the user to see spam entering the mailbox. However, since this has no capability to intelligently detecting sentence context, false positive will be very common. Low - With this setting, even the Microsoft-supplied anti spam filter Outlook algorithm is turned-off. Only obvious spam is blocked, like email messages with multiple mentions of the word "Viagra" or other similar known spam keywords. If this setting is chosen, the user takes the responsibility of being the frontliner of blocking spam manually. No Automatic Filtering - the default setting, where only the anti spam filter Outlook algorithm is used, not the filtering set defined by the user. Active Directory can block emails only based-on the policy enforced by the system administrator. Safe Lists Only - no filtering is used, instead, the users maintain a list of people in their contact lists. Users can only receive emails from persons that are on the safe list. This is the most secure setting, especially useful if the user expects emails from a list of contacts only and disqualifies unlisted senders from ever sending emails to their email address. When used extensively, any email address that is not part of the Safe list will be marked as a spammer by the anti spam filter outlook algorithm. Employees can define for themselves a list of "trusted contacts" of who can send email to their address. Any domain name and email address added to the list will never be tagged as spam by the anti spam filter outlook algorithm. However, this Safe Sender list is only applicable for Exchange-Outlook pair, not in Outlook online version. The list is limited to 1024 entries only, users must think carefully who to add or remove from the list. This is the counterpart of the Safe Sender list. If the user belongs to a distribution email list defined as a safe recipient, only then the user's email can enter the receiver's mailbox. Any email or domain added to this list will be able to send email and will never be blocked by the anti spam filter outlook algorithm. Any domain or email address added to this list have their emails automatically blocked by the anti spam filter Outlook algorithm. Junk Email folder quarantines all emails coming from a sender belonging to the blocked senders lists. Users can add or remove an entry to this blocked sender list, but the maximum capacity is just 500. Used to block a specific domain extension, any domain extension in it will be blocked by anti spam filter outlook algorithm. Anyone who don't want to receive emails from a .ph domain, for example, can add ".ph" to the list, and everyone with an email address using such top-level domain is blocked. Of course, users can still view it from the Junk Email folder, if they so choose. Fortunately, relying solely on Microsoft's anti spam filter outlook algorithm is not the only option. System administrators can fully take advantage of a 3rd party hosting service that blocks spam email even before it reaches the user's MS Outlook mailbox. One such anti spam solution that better isolates spam from out of user's mailbox is Comodo Anti Spam Gateway. Better than the anti spam filter Outlook algorithm, Comodo® Anti Spam Gateway quarantines suspicious attachments. Enabling users to confidently open and access email attachments comprehensively compared to the basic blocking capability of the anti spam filter Outlook algorithm. Comodo Anti Spam scans the emails in the background for malicious contents that may harm your computer and the corporate network.